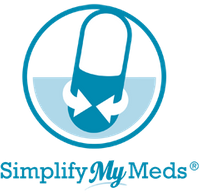 Simplify My Meds is a coordinated prescription refill program. It synchronizes your prescriptions to be refilled on the same day each month. Forgotten to call a pharmacy and run out of a medication? Called the pharmacy and realized you needed to get a refill from the doctor? Felt like you were making too many trips to the pharmacy? Wished you had more time to do the things you enjoyed? There is no need to call your doctor for prescription refills because all refill requests will be handled by the pharmacy. This program allows for fewer trips to the pharmacy and that means more time to do the things you enjoy. Your pharmacist will review your prescription list each month and he or she will also monitor changes after your doctor or hospital visits. You should have no worries about running out of medicine. On top of this, we can even coordinate refills for multiple family members so they are all filled on the same day. Upon enrollment and until we are able to get your maintenance medications synced, we ask that you continue to text us using our mobile app or call us as you run low and need refills. We will then "short fill" these medications so they all begin to run out at the same time. Once we've synced all medications and about one week before your scheduled pick up or delivery date, the pharmacy will text or call you to ask if there have been any medication changes since the last round of refills. Should you choose to call us, or if there have been any changes, we'll review your medications with you, see how you're doing, answer any questions you may have, and can even look for ways to save you money on your medicine. Should you choose not to call us, or if there have been no changes, we will refill those maintenance medications. Our pharmacist will review your order and one of our pharmacy technicians will contact your physician if you need a refill. You'll receive a reminder text message or call when your refills are ready. If you experience some of these same issues when it comes to your prescriptions and you would like to simplify this process, then our Simplify My Meds program is for you and its FREE to enroll! Make an appointment or stop in and speak with one of our staff members to enroll in Simply My Meds or complete the enrollment form and agreement form on our website. list of these, to the appointment. However, if you are unable to come in, we are able to do this over the phone as well. Together, we will establish your refill date. All future refills will be based around this date and any new medications we have not yet filled, will be filled with enough medicine to last until the established date.